The Sri Lanka Travel Blog has been struck by an enthralling piece about whale watching in Sri Lanka that we have spotted on the Lanka Business report Website. Whale watching was first mooted back in the 1980s when according to the report whales began to enter Trinco harbour, one of the great natural harbours of the world, using an old submarine canyon. But plans to turn Trinco into one of the world’s great whale-watching destinations were shelved because of security restrictions during Sri Lanka’s separatist conflict. The end of that civil war has seen controls eased on Sri Lanka’s east coast and Chaaya Blue has begun to operate whale-watching tours during part of the year. Date from the Sri Lankan navy has confirmed that whale sightings are in the 80-90 per cent region for confirmed sightings, the level regarded as necessary to make tourist whale trips an attraction. First indications are that the whale spotting season could take place not just from December to April, low season for the east coast, but could continue as late as September, which would fit perfectly with the peak holiday season on this side of the island. There is a growing contention, too, that the Koneswaram Temple on the top of Swami Rock is one of the great places to observe whales from an onshore location. There is so much more in this excellent piece, which the Sri Lanka travel Blog urges everybody with an interest in wildlife to read. What this admirable intelligent feature also makes clear is that with opportunity comes responsibility. Sri Lanka’s whale-watching boon needs careful regulation. Responsible tour companies are discussing the need for a licensing system for operators and boats – a solution that the Sri Lanka travel Blog wholeheartedly supports. “Unfortunately our experience was hugely marred by some extremely irresponsible (not to mention obviously cheap) tourists who had chartered a local fishing boat to come whale watching. The boat sounded like they had jerry rigged a Tuk Tuk engine and the fishermen had absolutely no respect for the animal, charging up and down and scaring the whale into taking short surface breaks. “The irresponsibility of the fishermen is one thing, but the sheer stupidity of the tourists is something that has to be seen to be believed. For the sake of a few thousand rupees theses cheap tourists put the wellbeing of one of the world’s most majestic animals at risk. 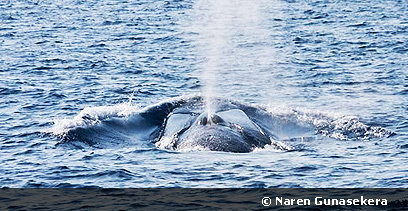 Sri Lanka is one of the best and easiest places for blue whale watching. Take a tour off the southern coast of Sri Lanka to get a close enclosure with the largest animals on earth. Blue whales and sperm whales have been spotted in the deep seas at Kalpitiya in this beautiful island of Sri Lanka.